A fun basketball simulation for young children! 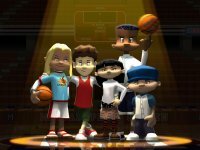 Backyard Basketball 2007 is the fourth iteration of the popular series where kids play basketball with fictionalized kid-versions of professional athletes. In this year's game, kids can take it to the hoop with youthful versions of Paul Pierce, Shaquille O'Neal, Allen Iverson, Tracy McGrady, Yao Ming, and others. The game is available for Sony's PlayStation 2 (PS2), the PC, and Nintendo's Game Boy Advance. This is a review of the PS2 version. From the main menu, kids decide what kind of basketball they want to play. There's Mini Games mode, where you practice shooting, passing, and dribbling; or you can opt to play a game of Horse. For a quick game by yourself or with a friend, choose a Pick-up Game. And for more intensive play, select the single player Season Game, where you coach a team through a 14-game season. You are trying to snag the coveted Backyard Basketball Association's Championship trophy. Since this is a game of 3-on-3, kids select five players from a pool of 18 kid-pros and 22 regular Backyard Kids. The Backyard kids are cartoon boys and girls who come in a variety of sizes and races. 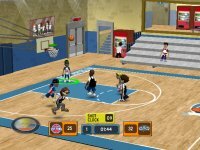 Kids who have played earlier versions of Backyard Basketball will notice that the Backyard Kids have grown up a little and are funkier. When deciding on which kids to select for your team, you can review stats for each player to determine how good the player is at inside shots, outside shots, defense, quickness, and ball handling. The key to winning is to figure out which team members play best together. This game works well as an introduction to playing sports video games because the controls are easy. On offense, you push one button to shoot, and the others to pass, crossover dribble, or call for a screen. On defense, buttons are for trying to steal, rebound, guard hard, and switch players. And for kids who aren't very good with using the controls, the game's artificial intelligence kicks in to make things happen. What really makes this game fun is the inclusion of "power-ups." You earn power-ups by scoring baskets. When you fill your power-up meter, you can choose to add some craziness to the game, like encasing your opponents' legs in a block of ice. Minor annoyances include repetitive comments by the color commentators, limited dunk moves, and the inability to do much on defense. On the plus side, the sound reflects the ambiance of a real game, and the chatter is amusing. For young kids who like the game of hoops, Backyard Basketball is an excellent choice. It's just plain fun to play with pint-size versions of the pros, on over 10 different courts, with real NBA team logos and uniforms, three levels of difficulty, and with or without a friend. You can even unlock new players and bonus items, including making players' heads getting bigger. Don't be surprised if this game turns your mild-mannered kid into a boards-crashing hoopster.